Faith is an important aspect of the Buddhist Path to liberation. I am not talking about blind faith in personalities or fickle attachment to dogmas, I am talking about a discerning yet unwavering trust or confidence that one deliberately cultivates in order to dispel doubt and all other obstacles to spiritual progress. In this post I will endeavour to explain exactly what is worthy of our faith and why. I go to the Buddha as a refuge. I go to the Dhamma as a refuge. I go to the Sangha as a refuge. For the second time, I go to the Buddha as a refuge. For the second time, I go to the Dhamma as a refuge. For the second time, I go to the Sangha as a refuge. For the third time, I go to the Buddha as a refuge. 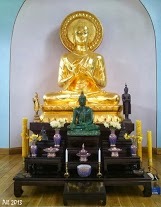 For the third time, I go to the Dhamma as a refuge. I am of the nature to decay. I have not got beyond decay. I am of the nature to be diseased. I have not got beyond disease. I am of the nature to die. I have not got beyond death. All that is mine, beloved and pleasing, will change and vanish. I am the owner of my kamma, heir to my kamma, born of my kamma, related to my kamma, abide supported by my kamma. Liberation from this unsatisfactory mode of existence was the Buddha’s ultimate goal; crossing the turbulent ocean of samsara to find safe dwelling on the shores of nibbana was his supreme achievement. His motivation for teaching the Dhamma was compassion for all sentient beings still suffering through ignorance. The way to enlightenment was made clear by him and has been preserved to this day by descendants of the Noble Sangha he founded around 2600 years ago. Indeed the Exalted One is thus: The accomplished destroyer of defilements, a Buddha perfected by himself, complete in clear knowledge and compassionate conduct, supremely good in presence and in destiny, the Knower of the worlds, incomparable Master of men to be tamed, the Teacher of celestials and men, the Awakened and Awakener, and the Lord by skill-in-means apportioning Dhamma. The Dhamma of the Exalted One is well-expounded, to be seen here and now, not delayed in time, inviting one to come and see, leading inwards, and to be known each wise man for himself. Chanting even these brief recollections on a daily basis has the advantage of gradually increasing our appreciation of the Triple Gem and motivating our spiritual practice. may I grow in the Master’s Way. For me there is no other refuge. Again, this attitude of reverence should not be mistaken for blind attachment but recognised as discerning mental preparation – it is a deliberate strengthening of one’s resolve to keep on practicing, and to let go the cravings that are a barrier to the Middle Way Buddha himself walked. I am aware that some meditators regard ritual chanting as naive hero worship; they baulk at the idea of Buddha as ‘Knower of the worlds’ (lokavidu), ‘Incomparable Master of men to be tamed’ (anuttaro purisa-dhamma-sarathi) and ‘Teacher of celestials and men’ (sattha-deva-manussanam), for example, and they propose all kinds of reasons to justify their aversion. An argument I frequently encounter on the internet goes something like this: The Buddha most likely was a clever man with some great insights, however the teachings attributed to him were written down in a different language long after his death and messed about with by a variety of self-serving monks. The Kalama Sutta says we should know the truth for ourselves. To have faith in The Triple Gem is mere attachment to dogma and ritual, unskilful and not what the Buddha would have wanted. But such an argument begs the question: how can we ourselves hope to replicate the Buddha’s enlightenment experience if we are averse to practicing the advice he gave? Myself, I am inclined to agree with Gombrich’s assessment of the Pali Canon as by far the best evidence we have for what the Buddha actually thought and taught. Moreover, without the Noble Sangha who compiled and preserved the Canon there would be no Dhamma today. People are of course free to discard or re-imagine the scriptures as they see fit. But to deny the Buddha’s emphasis on faith in the Triple Gem, to dismiss the more contentious or awkward bits of canonical evidence as mere interpolation or propaganda because it doesn’t quite fit the modern notion of a libertarian and scientifically-minded Buddha, is to seriously miss the point. ‘Lay Buddhist Practice: The Shrine Room, Uposatha Day, Rains Residence’, by Bhikkhu Khantipalo (1995). Access to Insight. What The Buddha Thought, by Richard Gombrich (2009). Equinox, p. vii. Buddha, My Refuge: Contemplation Of The Buddha Based On The Pali Suttas by Bhikkhu Kantipalo (1990), Buddhist Publication Society. ‘Going for Refuge & Taking the Precepts’, by Bhikkhu Bodhi (1994). Access to Insight. ‘Kalama Sutta: To the Kalamas’ (AN 3.65), translated from the Pali by Thanissaro Bhikkhu (1994). Access to Insight. 2013, http://www.accesstoinsight.org/tipitaka/an/an03/an03.065.than.html. ‘The Scientific Buddha: Why do we ask that Buddhism be compatible with science?’ by Donald S. Lopez (2012), Tricycle. This entry was posted in Buddha & Buddhism, Commentary and tagged buddha, dhamma, enlightenment, faith, refuge, sangha, triple gem. Bookmark the permalink.